I have that exact edition of Instead of a Letter – somewhere. I’m sure I haven’t read it yet but I have read a couple of her other books which I enjoyed. I love Barbara Pym – I started reading them in my teens. She’s wonderful. Around the same time I discovered Elizabeth Jane Howard, and I still love them both. They make me feel like all is right with the world! I’m so glad to hear that you enjoyed The Luminaries. It’s quite an achievement isn’t? A book that seems to work on a couple of different levels (if not more). Yes February has gone in the blink of an eye! I am looking forward to Poldark and I really must get to The Luminaries. I agree that February has been rather dismal but the massed snowdrops in our garden have made a wonderful display and I will have to think of splitting some of the groups soon so that next year not only will there be more snowdrops but in different places. So glad you are enjoying Trollope but I’m jealous of your Diana Athill acquisition! Poldark is a sore subject with me! I will hold up my hands (both of them) to admit I have read one page of the first book – and that was enough for me! The written dialect was, in my humble opinion as they say, appalling but it was the made up title name that turned me off it. Don’t get me wrong I do not object to made up names but slapping Cornish and English together makes for a terrible relationship but then if he called it Poldhu I don’t suppose many people would have been impressed with a name that translates roughly as ‘Blackpool’. However, lots of people adored the books so I can’t deny the popularity of either the books or the television series. What I can point out, from bitter experience, is the effect that the television series had on my beloved Cornwall – ‘Poldark’ tea rooms, cafeterias, any object or situation that you could stick ‘Poldark’ in front of and the enterprising had a field day. Cornwall suddenly blossomed into a ‘Poldark’ theme park! Then the hordes descended on the place wanting to ‘live the dream’ as it were. Saying that the original Poldark television series was a lot of fun – all those RSC actors trying to sound Cornish had my family in whoops every Sunday evening – although my father, pure West Penwith, to his fingernails, needed some help with what the ‘locals’ were supposed to be saying. In the end we turned the experience into a game as the characters happily mispronounced place name after place name and we would sit around ‘the box’ shouting out the correct pronunciation. An early scene in the television series had our eyes popping out as well as one of my neighbours is seen ploughing with horses! Horses?!!! In the eighteenth century?!!! Nothing wrong with his ploughing – he’s an expert – but they would have used oxon to plough in those times! Horses pulled carts and provided transport! Gosh, I’m ranting and I didn’t mean to but when something gets under your skin it really, really irritates! I may dip into one or two episodes of the ‘new’ Poldark but I doubt it will either impress me or sustain me but the youthful part of me wants to shout: “It’s pronounced R’ DRUTH not RED RUTH”! at the television once more to rekindle all those memories of fun-filled family evenings of yore! Safer subject now. An old friend of mine who died many years ago, possibly before you were born, was Mrs Tremayne of Helligan. She adored Howard Spring and we had lots of lovely hours of conversations about his books. She had a enormous collection of his books on her shelves (possibly everything he had written and probably, knowing her, because she would have known him) but, unfortunately, when she died they were all despatched to a second hand book shop – charity shops were thin on the ground in those day – and I imagine they were sold off in ones and twos. The good thing is to imagine how many buyers of those copies admired his writing then went on to read more of Mr Spring! Rather like yourself discovering the ‘new’ amongst the ‘old’ as it were. Seeds blossom if well tended, don’t they? Happy reading and enjoy ‘Poldark’! I’m planning to re-read the first Poldark book too. Very much looking forward to the new series (and I hear Robin Ellis is playing the vicar). I’m in the middle of reading Ross Poldark at the moment and hoping to finish it before the adaptation starts. I’m pleased to hear you enjoyed The Luminaries – the length has been putting me off, but I will read it eventually! 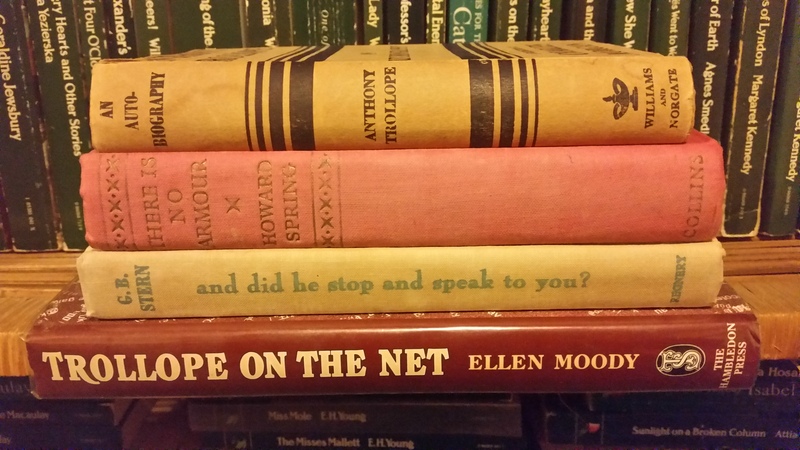 Lovely to see Trollope on your stacks. I loved the Autobiography, it made me like him even more (and I think you said you’d be reading the Glendinning biography too?). I was lucky to find a cache of Barbara Pym’s novels last night, but Civil to Strangers wasn’t among them. I won’t be satisfied until I’ve collected all of her books. I can understand you wanting to move on from the TBR Dare – six weeks was enough for me. I love all your new acquisitions and delighted you loved The Luminaries. 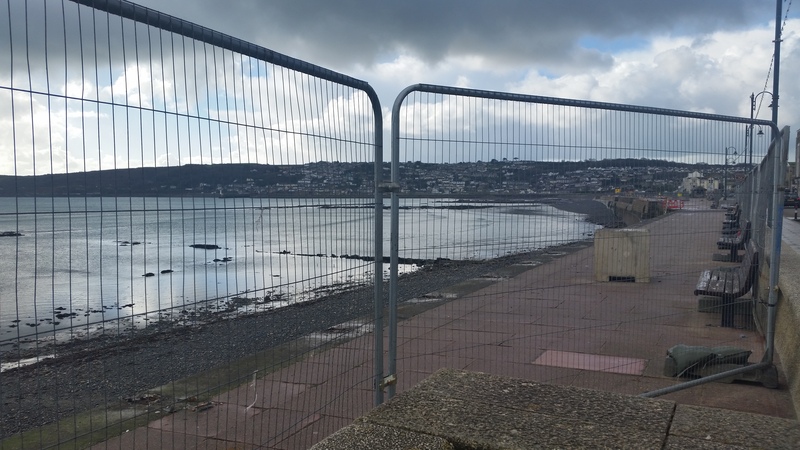 I hope you get your beach back very soon, Briar. I’m thinking I should leave Trollope’s autobiography until I’ve read more of his books … I loved the Poldark books, not sure I saw the original series, not sure I’ll watch this one – I’ll have a look at the cast and see if they match my idea of the characters first! 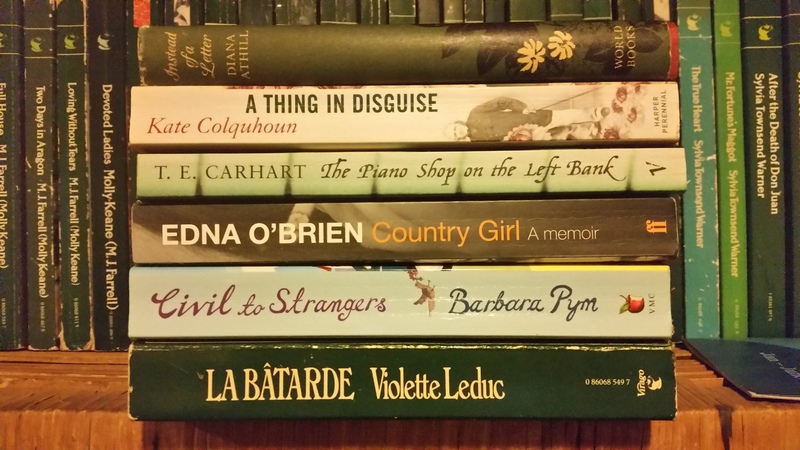 I’ve read one Violette Leduc novel and have the same copy of La Batarde sitting on my shelf to be read. She is an entirely fascinating woman and there is now a movie about her which has had some rave reviews, I’ve yet to see it myself. I read The Luminaries in December and it consumed me. I loved it!